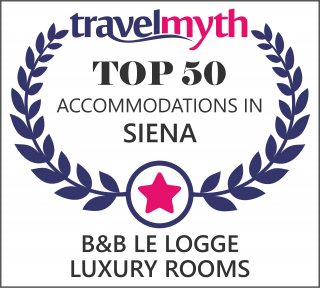 Le Logge Luxury Rooms, located in the heart of the city of Siena a few steps from the famous Piazza del Campo, dominate the imposing Pope’s Lodges. Erected in 1462 by the Sienese architect Antonio Federighi, were commissioned by Pope Pius II who gave it to Piccolomini family from which he came. The B&B, recently built, is located on the top floor without elevator and has a breath-taking view of the city. It is characterized from the fascinating contrast between history and modernity, frescoes and ultra modern furnishings. The location is equipped with under floor heating and air conditioning in all rooms. It consists of a large living room about 50 square meters which houses the breakfast area and the relax corner dedicated to our guests. Along the corridor adjacent to the common room, there is the reception, a cosy, modern and functional location. The corridor leads to two large frescoed rooms, furnished in a modern style, both with private bathroom and balconies that overlook on one of the main streets of Siena. Upstairs, there is the junior suite that features a spectacular interior balcony overlooking on the common room, a single room with dressing room and private bathroom. The third and last floor is the pride of our B&B: the super penthouse is characterized by a 360° view on the city, private bathroom with sauna and Turkish bath. Vernaccia is a large and bright double bedroom, with frescoes ceilings in stark contrast to a modern and functional furniture. Double room, with frescoes ceilings and not habitable balcony that overlooks the historic center of Siena. Brunello is a junior suite located on the penthouse, characterized by a spectacular interior balcony. Super penthouse is characterized by breathtaking views of the city. Read our tips for do not miss any of the beauties of our magnificent city.